These cookies are a favourite of Dr. Jules. She often brings them in to the clinic and they are usually gone by lunchtime! Pulse walnuts in a food processor until they are the texture of sand. Combine coconut oil, almond butter, sugar, egg, and walnuts in a medium bowl and mix well. In a separate small bowl, combine almond flour, salt, baking soda and cream of tartar. Add to wet ingredients and stir to combine – this will be the base of your cookie dough. Refrigerator the dough for 20-30 minutes (or more, don’t skip this step!). 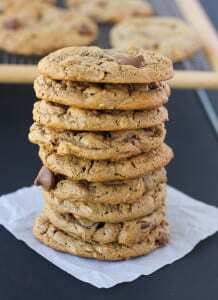 For regular sized cookies, make 1 inch balls of dough and place on cookie sheet. Flatten slightly and bake for 8-9 minutes. For extra-large cookies, make 2 inch balls of dough and place on cookie sheet, spaced well apart. Flatten slightly and bake for 12-13 minutes. Let cool on the baking sheet for a few minutes before removing to a cooling rack. Store in a plastic container at room temperature.